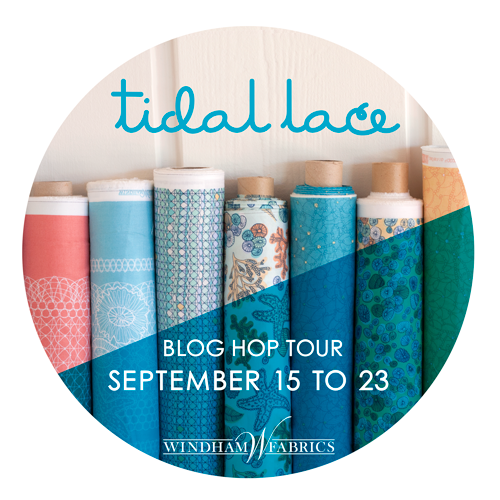 Welcome to my stop on the Tidal Lace blog tour! 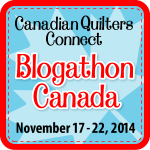 I first met Kim through the Quilt Design a Day group and we got to know each other over time. I was thrilled when Kim approached me and asked if I wanted to make something for her debut line of fabric from Windham. Of course I said yes! I had a design in mind almost immediately. I love Tidal Lace so much. The colors, the texture, the OMBRE! Woot! Ombre. I thought a long time about all the wonderful things I could say about Tidal Lace. Kim did an outstanding job in her debut collection, and it shows. The prints are soft, delicate, and so very very versatile. The colors are a feast for the eyes, and overall Tidal lace it suited to so many different things, which you will see in the coming days as you hop from blog to blog. I absolutely adore the starlight blenders and the tidal lace border print. Oh, that border print! I have plans for that print, which may or may not include fussy cutting a whole lot of skirt panels. We will see. When I saw Tidal Lace for the first time, I was really struck by it. I knew Kim’s inspiration-days sifting through antique lace with her grandmother, family vacations to the ocean, and how she connected the memories into the collection. The stories really stuck with me. Most of us had someone in our lives, a mother, grandmother, favorite aunt, that taught us to sew or planted the seeds of creativity that later sprout and flourish. In my family, quilts were given for any occasion-new babies, weddings, moving out on your own or just because. 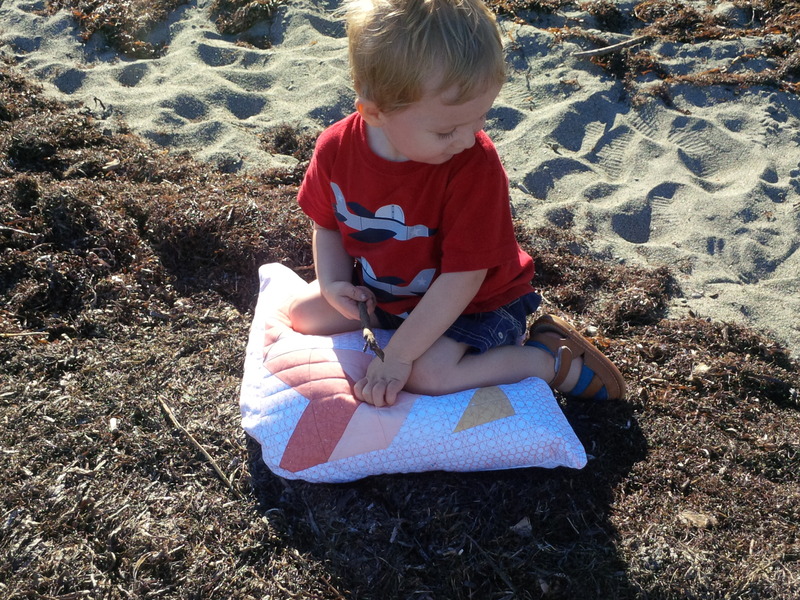 My own grandmother instilled an appreciation of quilting into her children and grandchildren. I have memories of visiting my grandma at the local quilt shop, where she would let me play with jars of buttons and scraps, and of sitting in her basement making our first quilt together. I still have that quilt, and I remember how happy I was to be able to spend so much time with grandma. 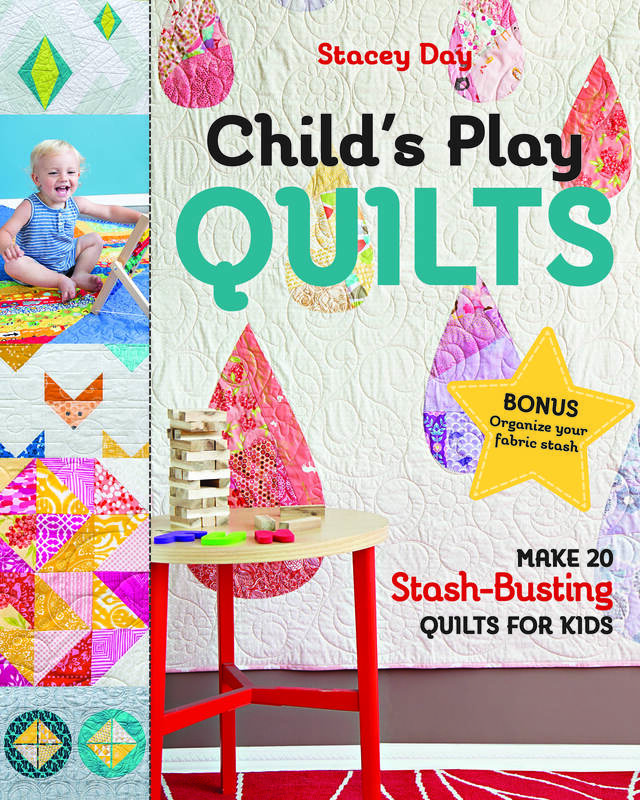 I also started thinking about quilting, and how as quilters we use fabric to make connections and create memories. We create to express love, friendship, joy, and also in times of hardship and sorrow. Quilting forms threads, connections, between individuals, friends, and family. The sharing of ideas and inspirations, whether its blogging, instragram, or a casual conversation at work or in the grocery store, strengthens those connections. Every handmade treasure we gift, swap, share and show add more threads, until the connections form a delicate lacework that strengthens with each pass. Many of us have formed strong bonds of friendship with people we may never meet, all centered around the craft of sewing and quilting. We are part of a community, based on sharing and inspiring. I am honored to be able to express myself in fabric and thread, and be able to share the experience with others. I used Tidal Lace to create a queen size quilt. I wanted something that would be simple, letting the fabrics shine and take advantage of the amazing border print. 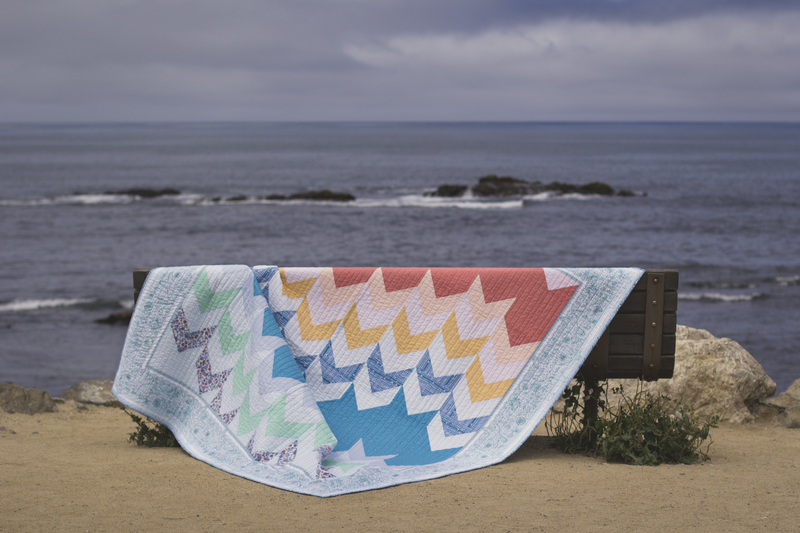 The pattern, which will have four sizes, will be coming around the same time as the collection is released is now available from my Craftsy shop. In the meantime I really wanted something to share with everyone. 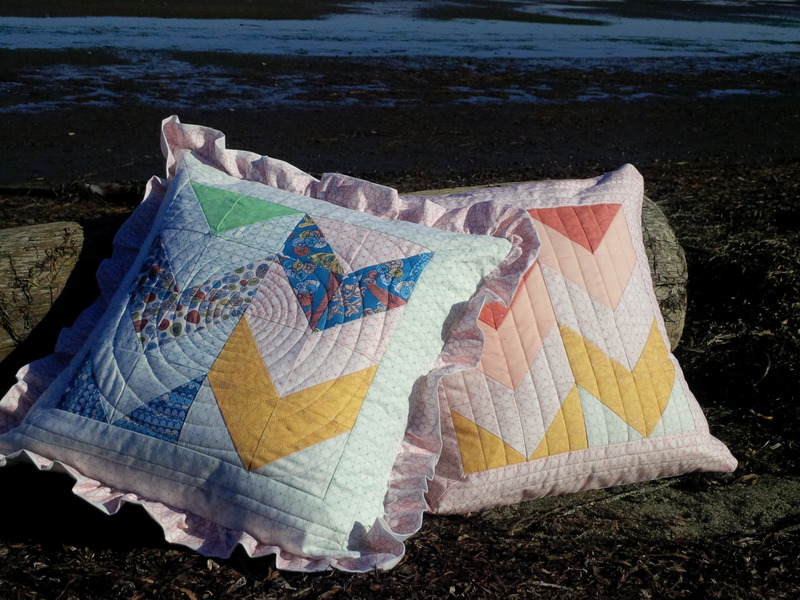 There were a lot of leftover half square triangles left over from the quilt, so I chose to make pillows to match the quilt. They whip up quick and we had a lot of fun at the beach taking pictures. After the tutorial there is a Fabric Giveaway! 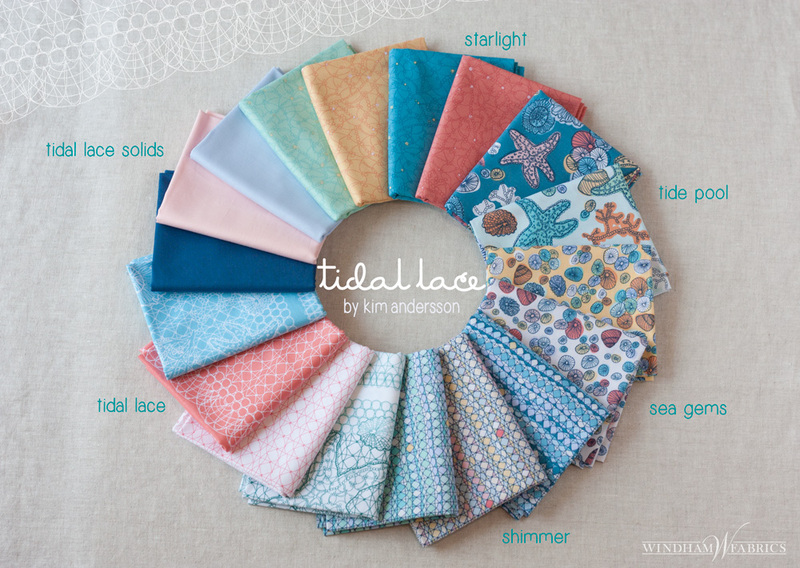 Windham was generous enough to provide a full fat quarter bundle of Tidal Lace for each blog to give away! 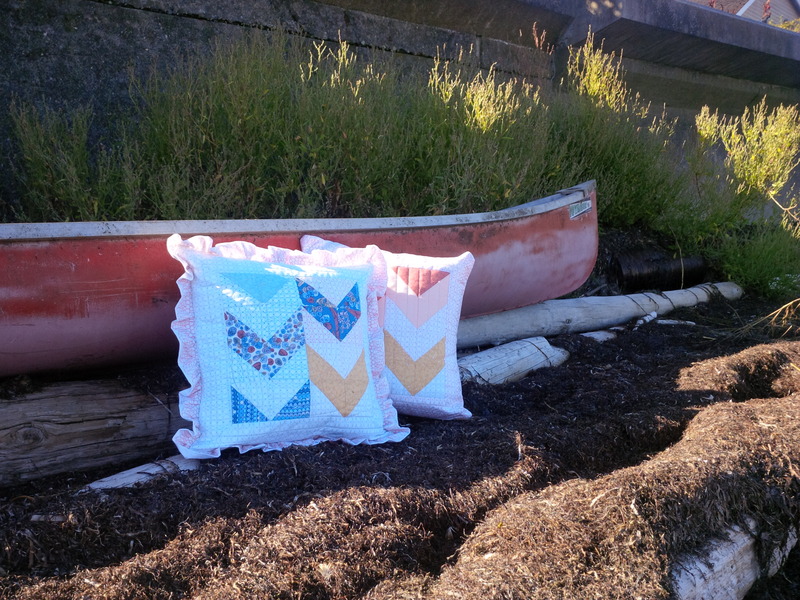 When you’re done here, hop on over to Anne @Play-Crafts and check out her awesome pillow! The full hop list can be found here, be sure to visit everyone and enter for your chance to win a bundle. There is a whole lot of talent packed into this hop, and I can’t wait to see what everyone else has planned for Kim! 1. Sew the print HST’s right sides together with the background HST’s to make 16 HST squares. 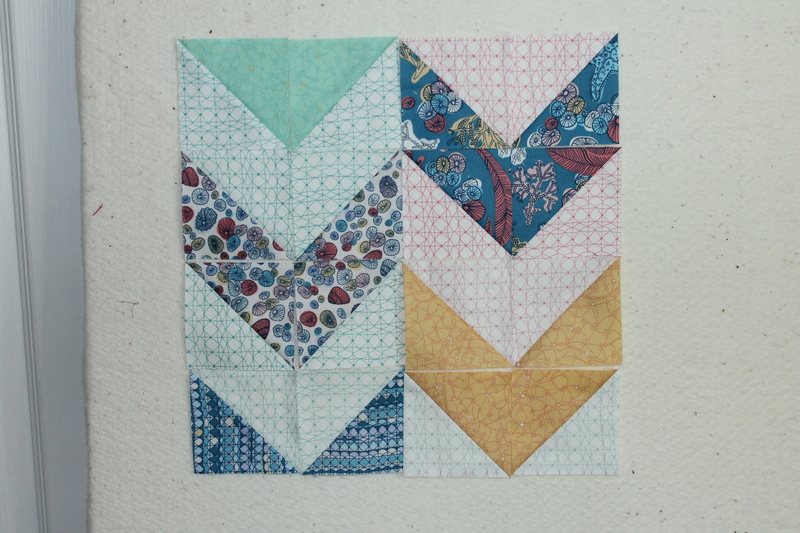 Press and trim the squares to 3 1/2″. 2. 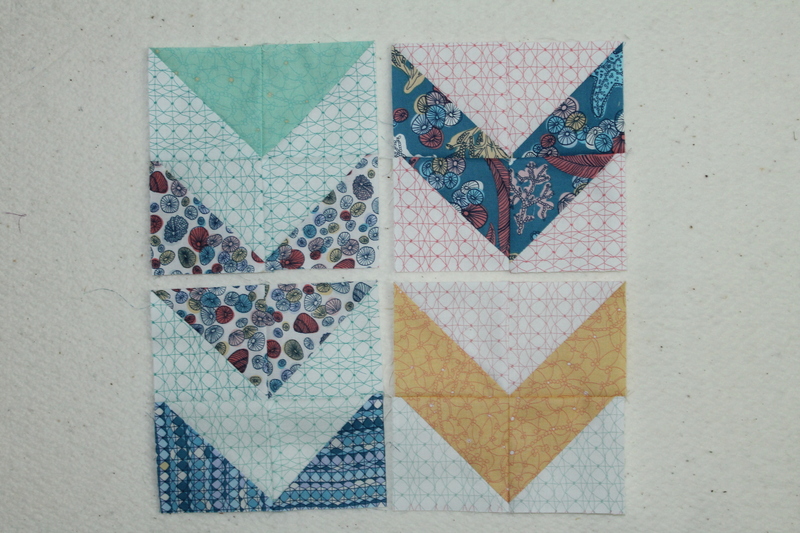 Arrange the squares on your design wall or cutting table so that the HST squares form chevrons. Play with the layout until you are happy with it. 4. 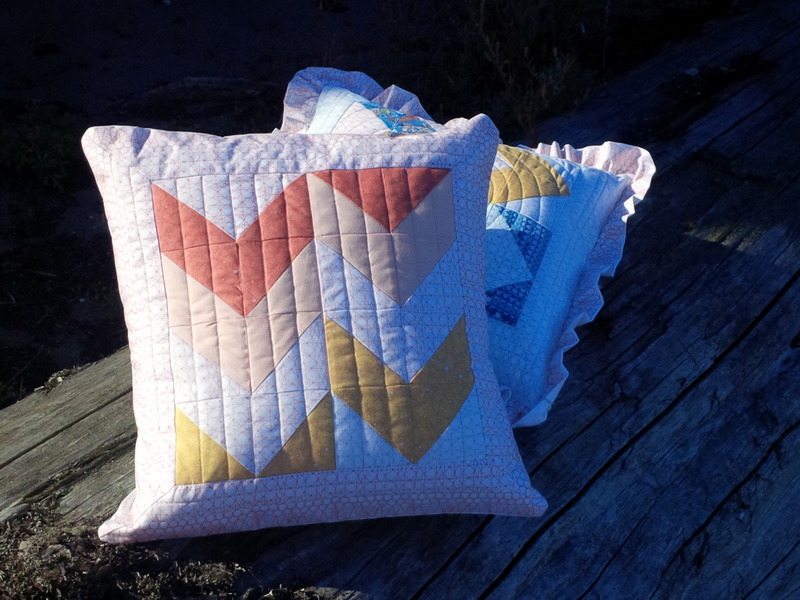 Sew the chevrons together to make the center of the pillow. Press well, square and trim. 5. Mark the seam allowance in the corner of the pillow center. 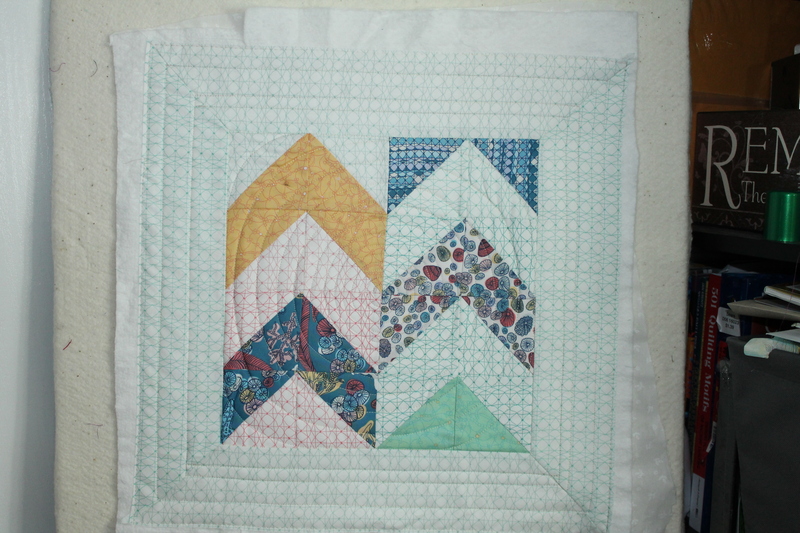 Pin the border strips right sides together to the pillow sides, matching centers. Sew the border strips to the side of the pillow the marked corner of each seam allowance. Press the strips out, pin the top and bottom and sew in the same way, stopping and starting at the corner. 6. 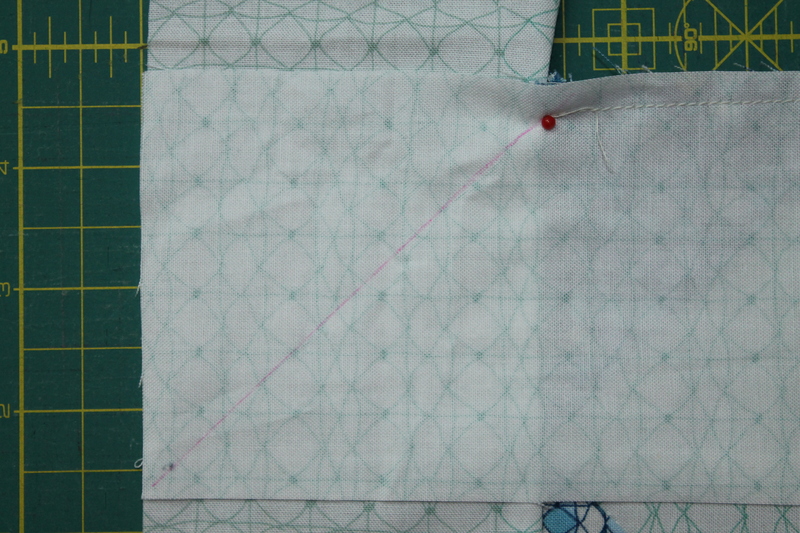 Draw a line from the corner of the seam allowance to the edge of the strip. 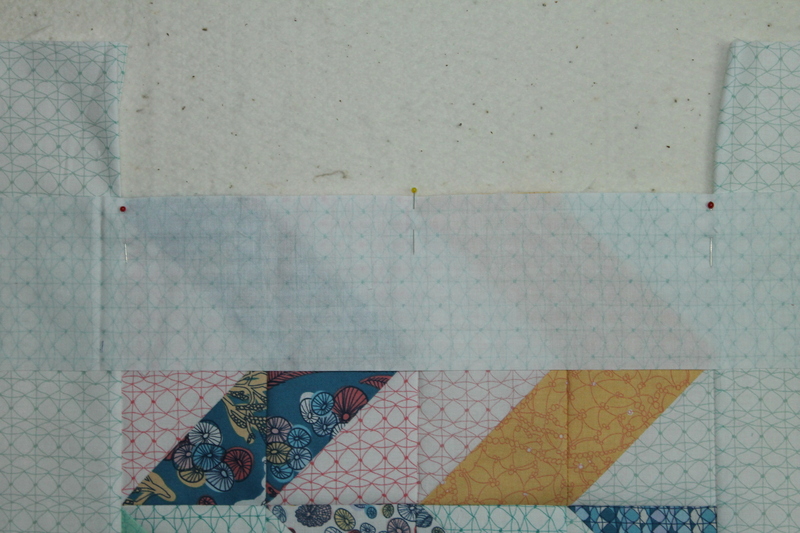 This will be the stitch line for the your mitred border. Do this for both sides for the top and bottom strips. 7. 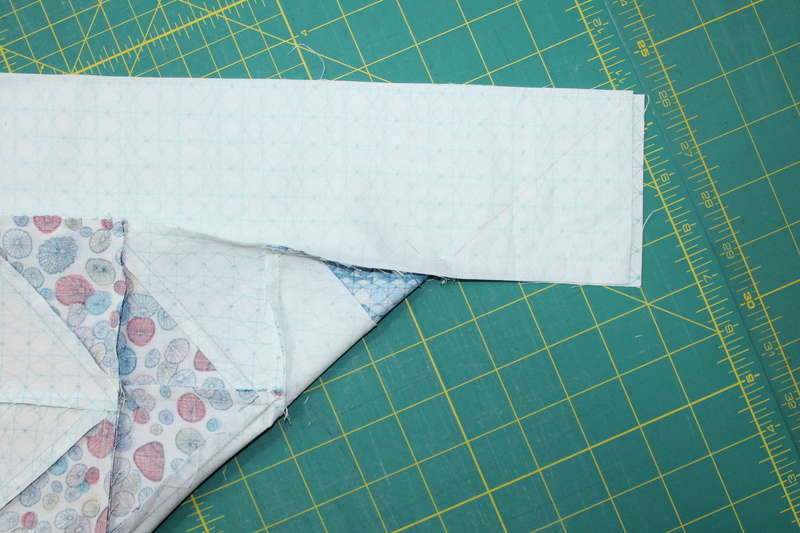 Fold the pillow right sides together on the diagonal so that the ends of the border strips are matched up. 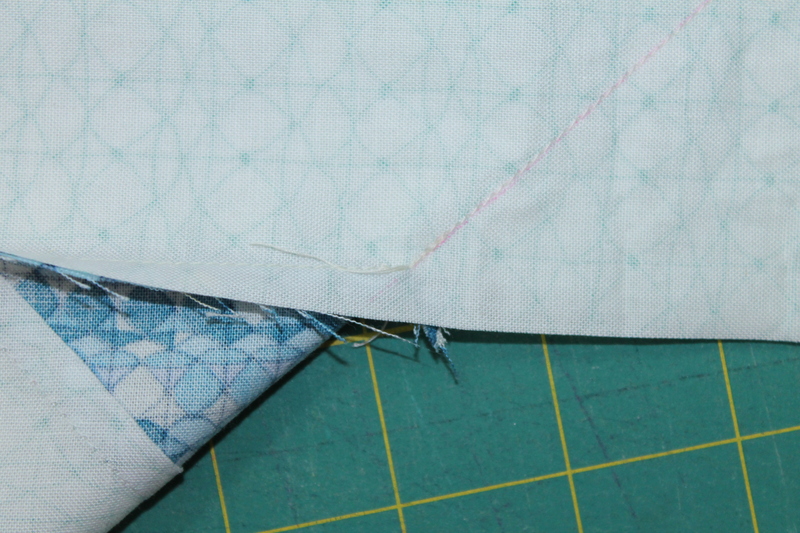 Push the seam allowances out of the way and sew down the line, starting at the seam allowance and stitching the edge. 8. Trim the seam to 1/4″. Repeat sewing for the remaining three corners, trim, and press all the seams open. Press the pillow top well. 10. Take a 14 1/2″x 18 1/2″ rectangle. 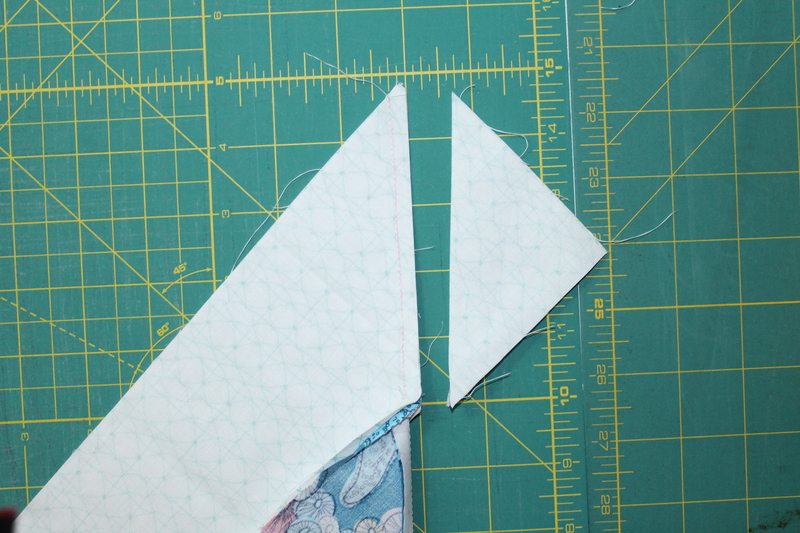 Fold one end over 1/2″ to the wrong side, and then 1/2″ again, so that the raw edge is covered. Repeat for the other rectangle. Topstitch next to the fold. 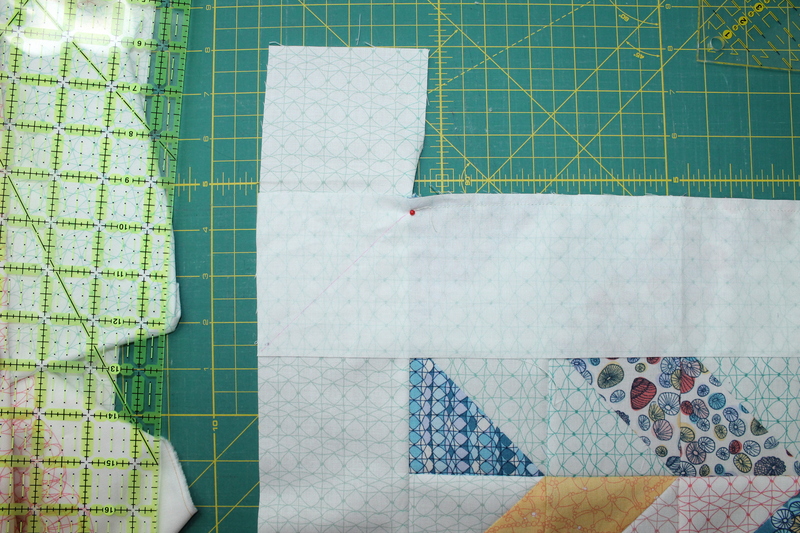 Layer the pieces right sides together on the pillow front, so that the finished edges overlap by 4″. Stitch around the pillow 3/8″ from the raw edge. 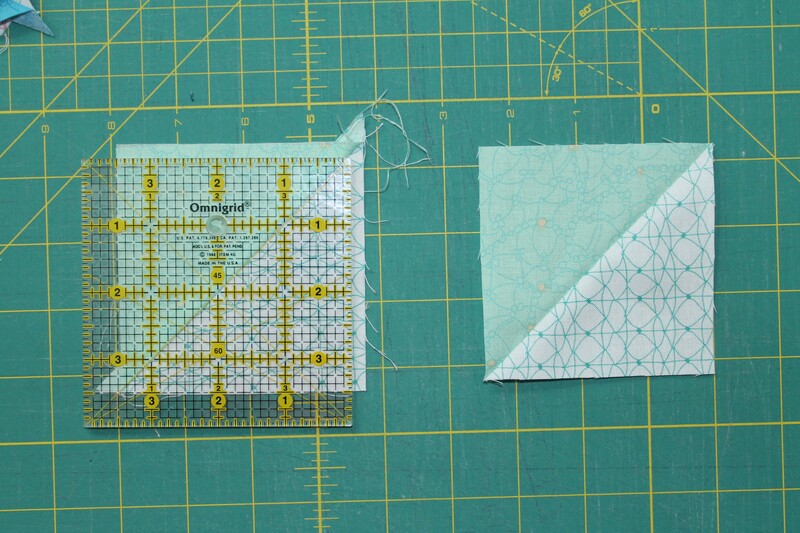 Trim the corners and finish your edges either with a serger or a zigzag/overlock stitch on your domestic. Turn the pillow to right side out through the opening in the back, stuff with an 18″ pillow form, and enjoy! The pillow finished slightly under 18″ square, giving the pillow some loft when the form goes in. Voila! I hope you enjoyed the tutorial! The winner will be drawn Sept 23 at 8pm PST. 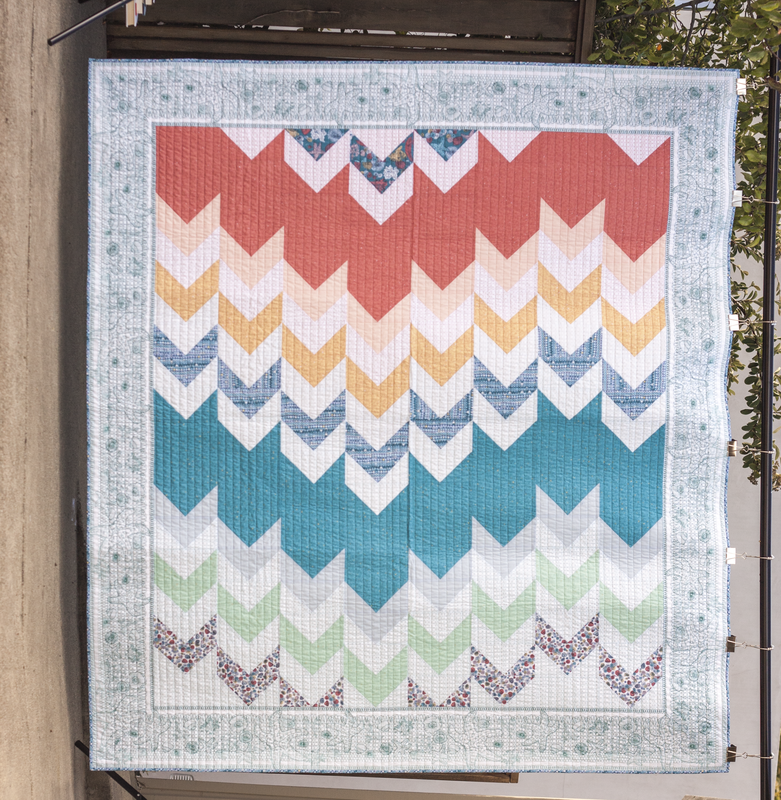 Make sure to visit the other blogs to see their awesome projects and inrease your chances of procuring this lovely bundle of joy!